Mon., Oct. 9, 2017, 5:03 p.m.
ALAMEDA, Calif. – Oakland quarterback Derek Carr is expected to return to the Raiders’ lineup for Sunday’s game against the Los Angeles Chargers, two weeks after suffering a broken bone in his back. 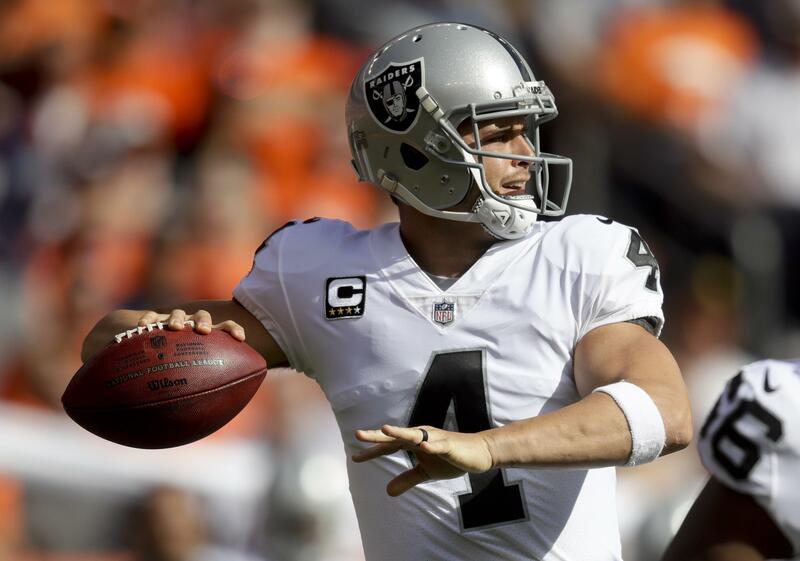 Raiders coach Jack Del Rio confirmed Carr’s return on Monday, echoing comments he made following the Raiders’ 30-17 loss to the Baltimore Ravens a day earlier. Carr was limited in practice much of last week. He got sacked by Denver defensive lineman Shelby Harris and took a knee to the lower back from defensive end Adam Gotsis during the same play on Oct. 1. There had been some speculation that Carr might play against the Ravens but Del Rio opted to keep the 2014 second-round draft pick inactive against Baltimore. EJ Manuel started in Carr’s place and passed for 159 yards and a touchdown but Oakland fell behind by two touchdowns early in the first quarter and never recovered. Del Rio praised Manuel’s effort and said Oakland’s problems against the Ravens went far beyond the quarterback position. Specifically, Del Rio pointed out that Baltimore handled the Raiders in the trenches and was more physical up front. The Raiders gave up 365 yards to the Ravens’ struggling defense and allowed quarterback Joe Flacco to break out of his personal funk. Oakland’s defense allowed two touchdowns, three field goals and forced just three punts. It didn’t help when linebackers Marquel Lee and Cory Smith were both forced out with injuries. Oakland’s already thin secondary also took a hit after backup cornerback Antonio Hamilton left with a possible torn meniscus. Despite three straight losses, Del Rio isn’t ready to make a massive overhaul. Oakland’s third consecutive loss left many players and fans frustrated and angry. A video that went viral on Twitter late Sunday night showed left tackle Donald Penn getting into a verbal confrontation with a fan while attempting to drive out of the players’ parking lot at the Oakland Coliseum following the Ravens game. Penn later tweeted out that the fan had thrown a bottle at his car. Penn also said he regretted getting out of the car to confront the fan. Del Rio said Monday he had not seen the video and had just been made aware of it. Published: Oct. 9, 2017, 5:03 p.m.